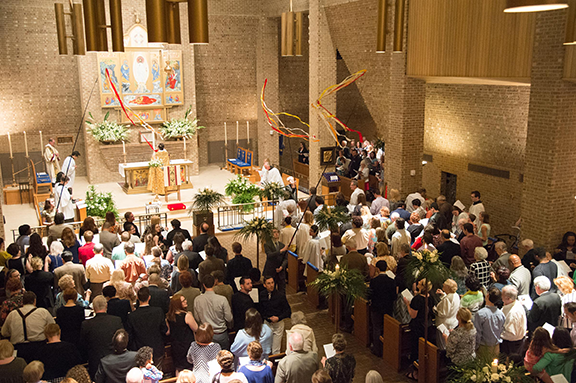 Joyfully celebrate Christ’s resurrection with us at Church of the Transfiguration! The Great Vigil of Easter begins in darkness. 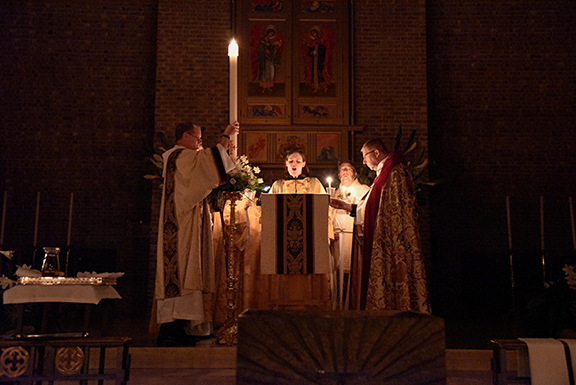 Out of this darkness, a new fire is kindled, from whichh we light the Paschal Candle, a symbol of the Christian Passover, in both its association with the pillar of fire that led the Israelites during their exodus from Egypt, as well as its association with our “passing over” from death to life through Christ. Next, we hear the Exsultet, an ancient hymn in which vivid imagery illumines our purpose in gathering: “Rejoice and sing now, all the round earth, bright with glorious splendor, for darkness has been vanquished by our eternal King.” Then we hear stories from the Hebrew Scriptures describing God’s gracious care, generosity, and saving power. Following the readings we turn to the baptismal font. 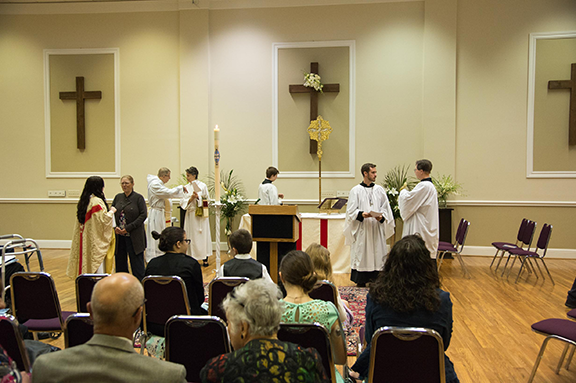 Christian baptism is a participation in the death and resurrection of Christ, a dying to sin in order to be reborn in him, and from the earliest times the Great Vigil has been the most appropriate occasion to welcome new members into the body of Christ. Each symbol of the liturgy having built upon the last, we finally proclaim the joy of Easter and hear again the story of Christ’s empty tomb. Alleluia is sung, bells are rung, and the first Eucharist of Easter is celebrated. A “Break the Fast” celebration in Roper Hall concludes the evening. 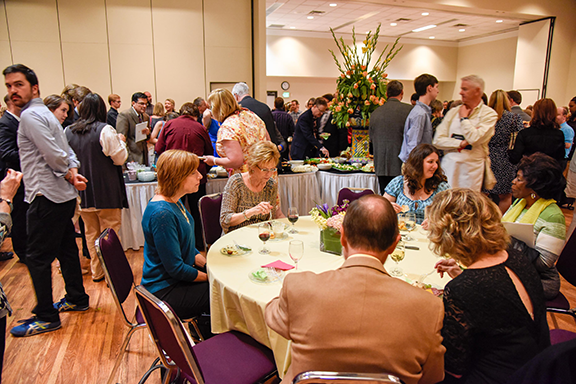 A “Break the Fast” celebration in Roper Hall concludes the evening as God’s people celebrate the end of the Lenten fast. Since the earliest decades after Jesus’ death, the Church has celebrated Christ’s resurrection as the pinnacle of the year. It is the “Queen of Feasts,” the greatest and oldest celebration of God’s glorious work through Christ, and though it begins on Easter Day, in truth it lasts a full fifty days, known as “The Great Fifty Days.” On Easter Day we say and sing again Alleluia, which was omitted during Lent. 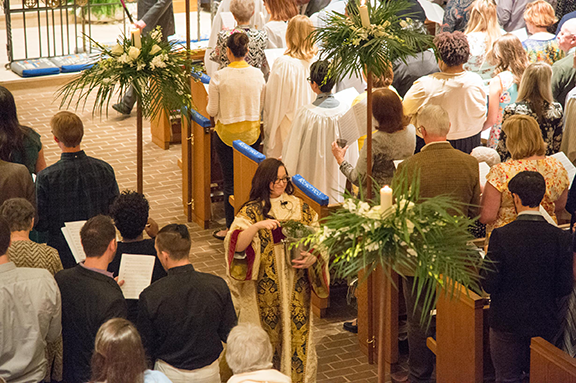 Throughout the Church’s history, Alleluia (literally, “Praise the Lord”) has served as an expression of joy that is especially appropriate at Eastertide. 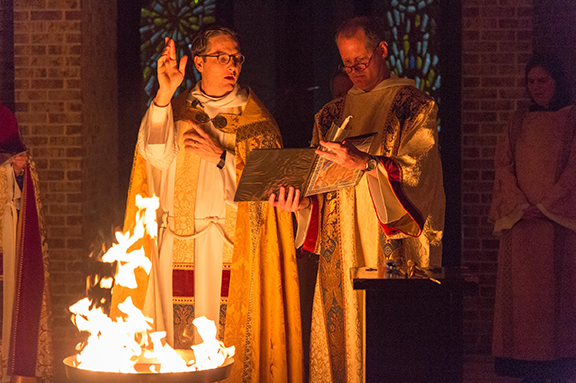 The font will remain central in all Easter Day liturgies, and you are invited to touch the water of the Holy Water Font as a reminder of your own baptism, and the fellowship all believers have with the risen Christ through those holy waters. The traditional posture of prayer during Easter is standing. The Council of Nicaea in 325CE forbade kneeling for prayer during the Great Fifty Days, and we encourage you to stand with joy and gratitude throughout our worship during Eastertide. 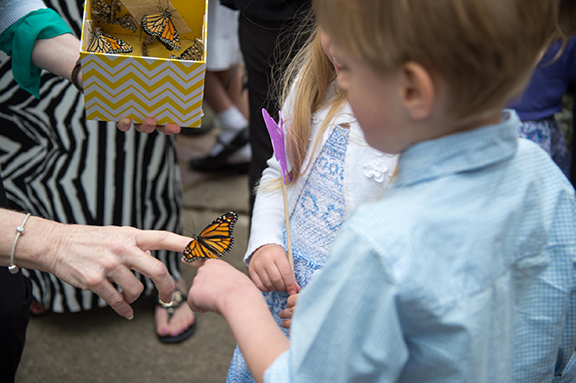 After the first two Easter Day services at 9:00 and 9:15 a.m., we invite you outside to the Church Lawn for a Churchwide Easter Celebration with a butterfly release, refreshments, and an alleluia search. 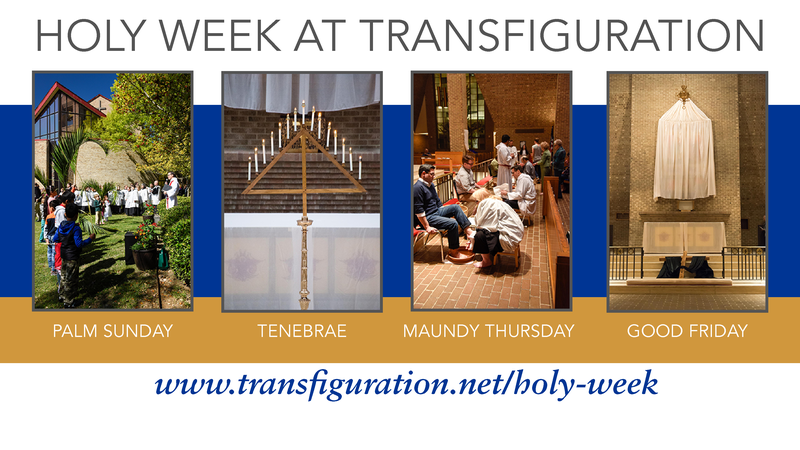 For information on the Paschal Triduum and Holy Week Services, please click here.